Social roles structure daily life because people adjust their behavior according to the role that they have in a specific situation. Online social roles are not necessarily the same as those in daily life and, because they are not so strictly assigned, the question arises whether they can be manipulated. We conducted a structured experiment to investigate whether the manipulation of online social roles can affect user behavior in a tagging task. Leyssen, M.H.R, van Ossenbruggen, J.R, de Vries, A.P, & Hardman, L. (2013). 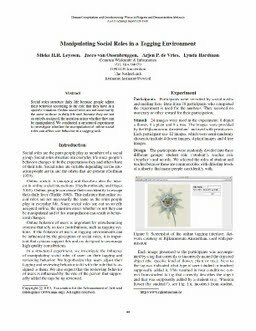 Manipulating social roles in a tagging environment. In Proceedings of Human Computing & Crowdsourcing 2013 (HCOMP 1) (pp. 44–45).